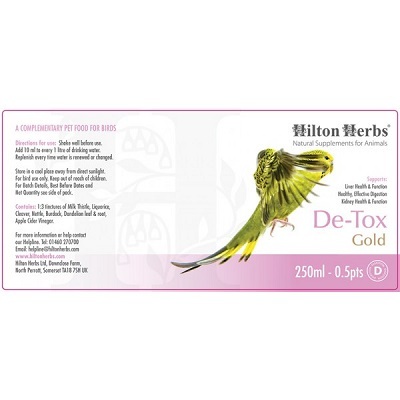 Use De-Tox Gold for all birds when they may need that extra bit of support and this tried-and-tested herbal formula will help your birds maintain healthy liver and kidney function all year round. We particularly recommend using this mix as a Spring detox, in conjunction with any conventional medication or with your routine worming programme. Add 10ml to every 1kg of soft food, *mix well and leave to dry and then feed. Full instructions will be found on the packaging.